As backyard bird enthusiasts, we often think about how to keep squirrels out of our bird feeders. What we often forget, is these pesky little creatures will often try to enter the birdhouses as well. Follow these simple steps to squirrel-proof your birdhouses this spring and help keep nests safe. Squirrels primarily enter birdhouses to find the food inside. Squirrels are after seeds, nuts and other vegetarian food items. Squirrels are not carnivorous, but that doesn’t mean they won’t kill nesting birds or put them at risk. The most pressing risk from squirrels is when they enlarge the entrance hole to the box. 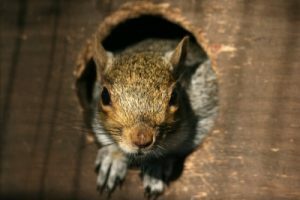 Squirrels will chew at the opening to gain access, in the process larger birds and other predators are able to find their way into a nest you thought would be perfectly safe. Predator guards are metal or slate rings made to reinforce the entrance hole and sometimes make it slightly smaller. The metal is impossible for squirrels to chew and keeps the hole the size you intended, perfect for the bird you are trying to attract and nothing else. Squirrels will often sit on top of a birdhouse and lean down over the house to access the inside. Prevent this by opting for a birdhouse with a longer overhang on the roof or by adding a roof guard. By adding extra roofing material, the squirrel will not be able to reach inside the entrance. Use a squirrel baffle on any pole-mounted birdhouse. The simple metal disc wraps around the pole, preventing squirrels from climbing up to the birdhouse. Any mounted nesting box should have a squirrel baffle. Baffles help protect from other predators–like cats, raccoon and snakes–too. Squirrels can be a ton of fun to watch in your yard! Keep their feeders far from birdhouses and make sure to properly squirrel proof nesting boxes and the two species can easily coexist (think about it, they’re already doing that naturally in most local parks). By taking an afternoon to properly squirrel proof your birdhouses, you will keep nests from invasion and spare all your family bird watchers the sadness of finding a nest torn apart.